Life often doesn't work out like you'd expect. I grew up in a family where conversations about science were a fairly regular event. My mom was finishing up her master's degree in entomology when I was born, so she was always coming in to our classrooms in elementary school with her insect collections and doing presentations on butterflies or insects in general. I loved science, particularly biology. My favorite class in college was an upper level biology symposium on bioethics. Once I started homeschooling, I discovered I really enjoyed physics as well, and chemistry has always intrigued me. But things like astronomy and geology? Meh. I mean, checking out rock formations at Yellowstone and other national parks was okay, but studying it? No, thank you. My husband had different science interests -- astronomy, electronics, aviation. Imagine my shock at having some children who do not particularly like science. Getting them through things like high school biology is HARD. William would much rather spend his time with history. Last summer, I attended a homeschool convention and as part of my job for the Homeschool Review Crew, I was combing the vendor hall and talking to people at the booths. Northwest Treasures already had a relationship with The Old Schoolhouse, as they provide a course for SchoolhouseTeachers.com (one of many reasons to check out that site!) I have thought their materials looked good, but I wasn't particularly interested in using them. A conversation with Patrick and Vicki Nurre, however, changed my mind. Specifically, the idea of a high school science course that is a bit more historical in nature had a strong appeal. 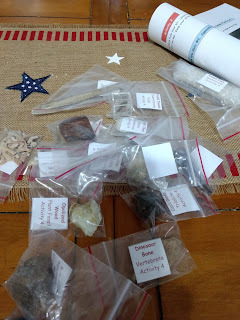 I walked out of convention having purchased Bedrock Geology, the "heart" of the Northwest Treasures Curriculum Project. That course has been fabulous, and both William and Thomas worked through it this spring. Geology and Apologetics. Go read the reviews of these! But back to what I had the privilege of reviewing. 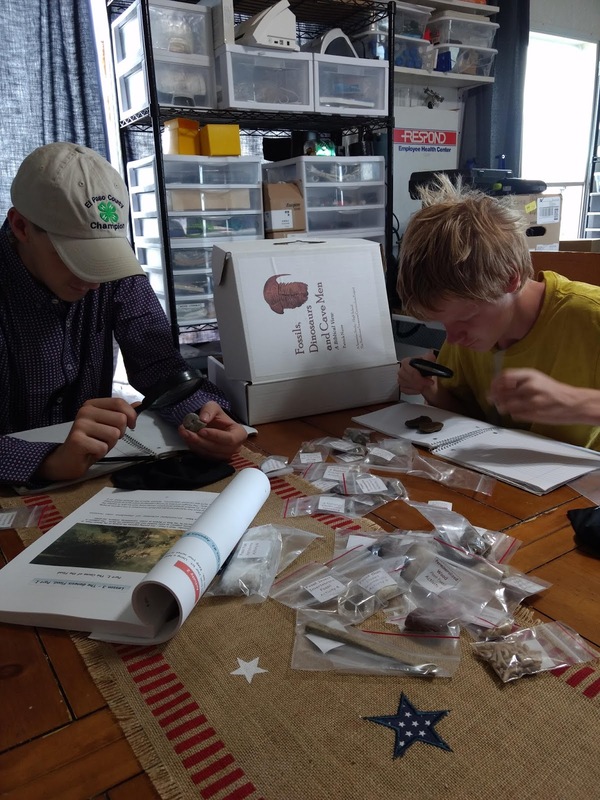 We received the Fossils, Dinosaurs and Cave Men Kit, which is intended for grades 8-12. 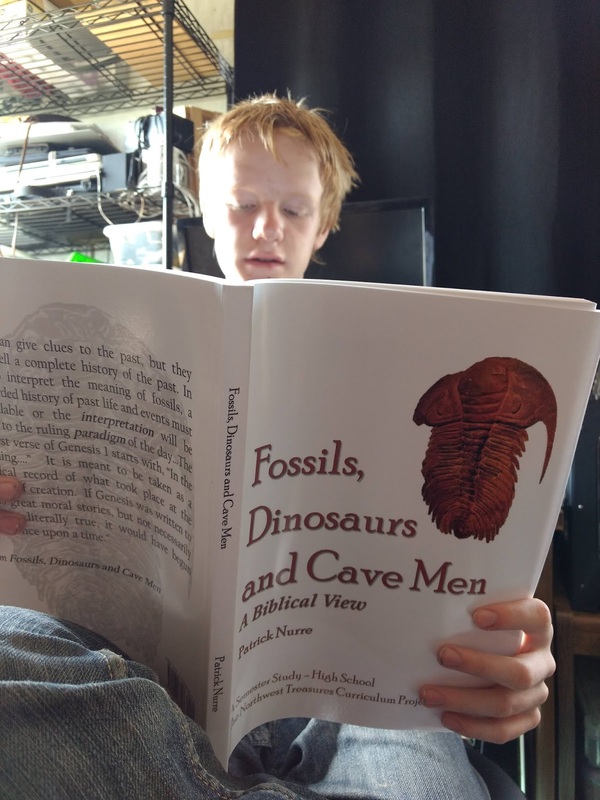 It includes the book of the same name, and it includes a whole lot of fossil specimens. And they are pretty neat. That all comes in a handy box/carrying case, which is really nice for keeping things together. 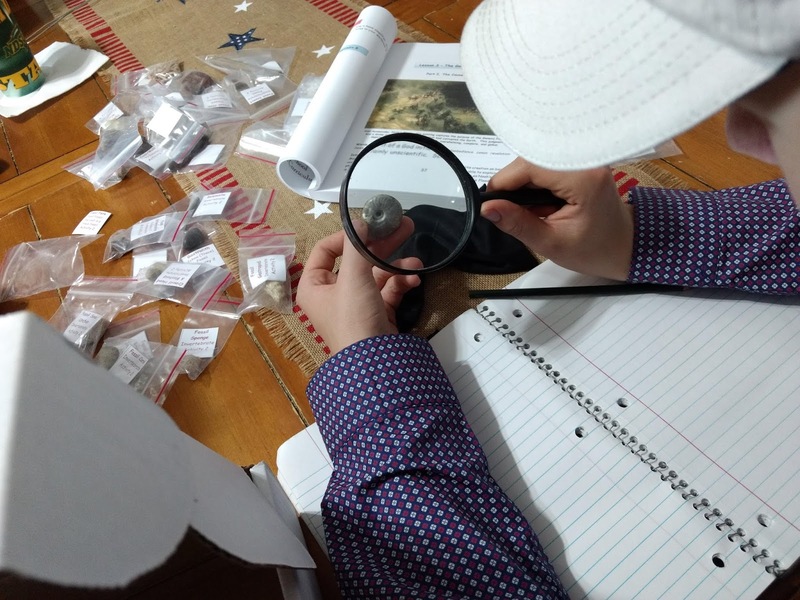 The course includes eleven lessons, plus an appendix on fossil anomalies that we plan to treat as a lesson as well. Most lessons can be completed in a week, though our plan is to add an extra week for some of the activities. The activities in this course are more academic than hands on. You do get a chance to check out the great fossil specimens. But you also have some activities that involve a fair amount of research and reading. So we stretched Lesson 4 out over two weeks, for instance. 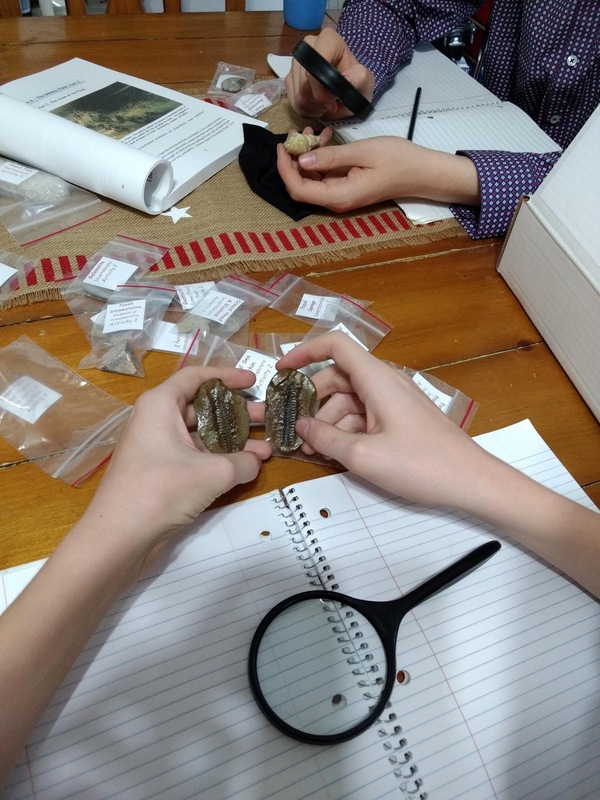 One week to work through the chapter and do the activities involving vertebrate, invertebrate and plant fossils, and another to research the geologic time table and read articles about it. We are probably going to be stretching lessons 6, 8, 9 and 10 out. That gives us roughly 17 weeks of coursework, assuming we don't change anything up when we actually get to it! Each lesson includes reading in the text, most have an activity, and all have quizzes. There is also a comprehensive exam. The suggestion is to study the vocabulary and read the text on day one, to spend days 2-3 re-reading and note taking and doing the activities, and to spend days 4-6 finishing up activities, reviewing and taking the quiz. Bedrock Geology had us doing a lot of more hands-on things using materials like Rice Krispies, sand, or plaster of Paris. Hands-on for the Fossils, Dinosaurs and Cave Men mostly involves getting a good look at the specimens in the kit. In the photos here, they are doing that for Lesson 2. You can see some really neat fossils are included! They are supposed to be taking notes on what they are observing, but both kids insisted I get the photos taken before they actually started writing. Apparently, I'm distracting when I have a camera. Who would have thought that me saying "Hold it right there a second, oh, move a little to the left so I can see the shell in the magnifying glass, good. Stay still." would keep them from learning? I love that we are able to complete a science course that isn't quite as intense, yet still contains a whole lot of information -- and solid information. While I wouldn't consider Fossils to be a lab science for transcript purposes, I do think Bedrock Geology was. The text is interesting to read -- we do it as a read-aloud first, and then the kids follow-up on their own when they go more in-depth and work through it a second time. There are lots of great images. I love that they include specifics on the foundation of modern geology, including dating for the various periods. This is from a young-earth perspective, however, so they also point out what they believe is wrong with modern geology when their interpretation differs. Most of that happens in a respectful manner that I appreciate. 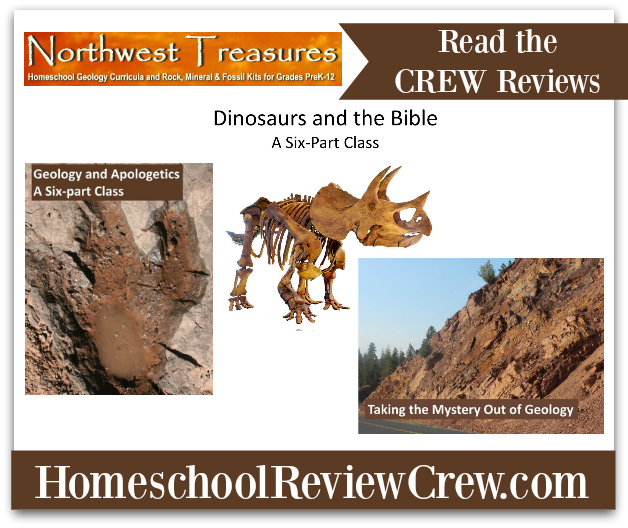 I had hoped to get a bit further in the course before writing this review, as I was particularly interested in getting through Lessons 5-7, on the geologic time table, the geologic column, and the main chapter on dinosaurs. We're almost there. I skimmed ahead a bit, and I do like how it is all presented, and I believe the kids will too. All three (considering William's opinions on Bedrock Geology here too!) boys have really enjoyed the Northwest Treasures courses. I would love to continue with the other titles in their high school curriculum: Volcanoes, Volcanic Rocks and Earthquakes, and Rocks and Minerals, The Stuff of the Earth. The specimens included are amazing and fun. All kinds of things are included from sea urchins and wood, to shark's teeth and dinosaur bones, to neolithic stone tools. We aren't to the activity where we look at the tools yet. 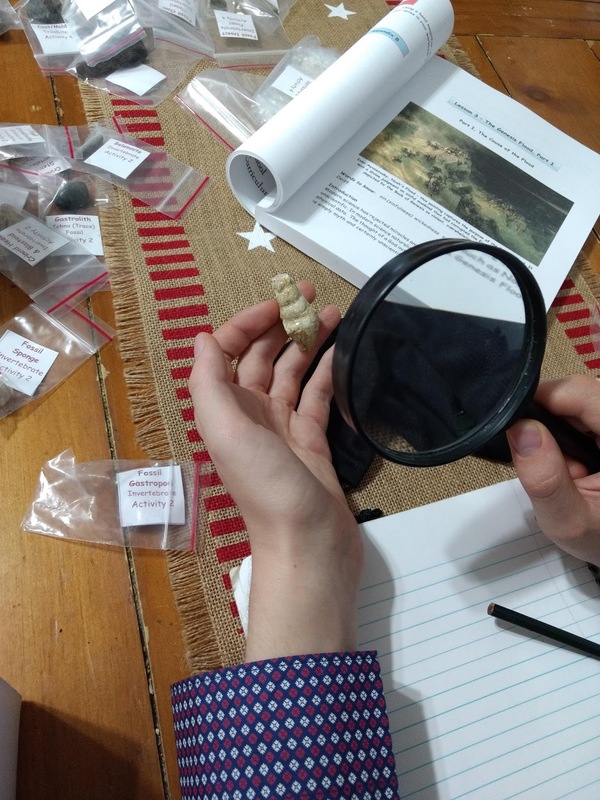 Northwest Treasures also has materials for younger ages, including Geology for Kids, which is meant for middle school ages. I loved Michele's review of this course. It sounds like a lot of fun! Thomas had asked to do another semester of Geology, so obviously he likes the material. The kids think the material is presented in a way that is engaging, mostly, and that Mr. Nurre makes is easy to understand. I would recommend at least trying out the Taking the Mystery Out of Geology session online!